Hi, when placing an image over an entire page I can't see neither the edge of the page (once it is covered by the image frame) nor the bleed box. Bleed box is not visible at all and objects are not snapping to it. Page edge is visible on master pages. We will be displaying bleed in the main view in an update 'real soon'. Guides and snapping will come at the same time or shortly after. Our bleed is quite basic at the moment and does not include a bleed view but a far more advance version should be available at some point before it is released. Also, please add the option to add bleed on the inside page edges of a two-page spread. Some printers are sticklers for this, requiring spreads to be "split" into individual pages before export, so there's a bleed all the way around each page edge, even in the middle of a two-page spread. "The other guys" not supporting this is a cause of most of our pre-press rework. Also please allow documents to start on page 2, so the first page is a spread, without the unnecessary blank page one. 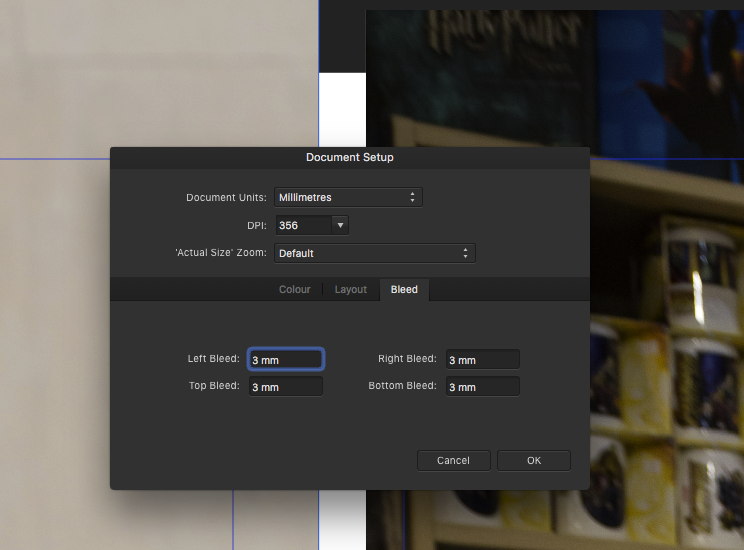 for exported pages, the bleed is added only on the first page. It is actually possible to do this in the Document setup choose Layout and Start on: Left. @russ99: One more possibility: Right click onto a page, choose „Start a New Section“ and fill in the page number, you want.